Welcome to Fort Valley State University's Online Learning Introduction Quiz! We are glad you have chosen to take classes with us! The Online Learning Introduction Quiz is a short review of what is expected of online students at FVSU, time and technology requirements, information on how to access your course, and how to find information on student resources. This Introduction Quiz should not take long to review, and it is not a graded quiz. The Online Learning Introduction Quiz is encouraged before registering for an online course. All online courses will be taken in our learning management system Brightspace by D2L. Attendance in an online school is as important as attendance in a traditional classroom. In order to learn, complete courses, and graduate, you'll need to log in and participate on a regular basis. Just logging in is not enough! We expect that you will spend one to one-and a-half well-focused hours per day on each course. During this time, we expect you to check announcements, respond to discussion posts and submitt assignments before the due date. Doing this will make you feel more connected to the course and not so overwhelmed because you're doing a little each day rather than playing catch-up. Of course, you do need to set aside some larger chunks of time a couple or more times each week to do some serious reading and completion of assignments and quizzes. It is not a good idea to leave all course work until the end of the week or end of the semester. Students who often do this find that they either a.) have been dropped from the course or b.) fail the course. FVSU Online courses do require that you confirm attendance within the first 5 days of the start of the courses as well as introduce yourself to everyone in the course. Reliable access to a desktop or laptop computer with adequate memory and processing capabilities is a must. Standard computer capabilities include ability to access coursework, download large files, and utilize media applications and synchronous meeting applications. Most courses use the online learning management system BrightSpace. Click here to see if your computer will run BrightSpace optimally. Access to a webcam and USB headset for video-based communication. Please see course syllabus for items that may be required by faculty in a specific course. Reliable access to high-speed internet access is required. This access should be free of data restrictions for downloading large files. Recent version of Microsoft Office Suite (Word, Excel, and PowerPoint at a minimum), a PDF Viewer, Anti-virus protection, a media player for both audio and video, Java, and the current Adobe Flash Player. Any course specific software or hardware will be listed in the course syllabus. In front of a computer accessing; reading assignments; and interacting with your instructor and fellow students. Sitting in class and listening to face-to-face lectures. How often should you log in to your FVSU online class? Online courses have very similar academic standards compared to their face-to-face courses. Approach your online course with this in mind so that you are not caught off-guard and fall behind. It is extremely important that you have a good place to work on your assignments. Find a quiet place with a good internet connection, access to power, freedom from distractions, and a place you can routinely visit throughout the course. Gain information on all of the technology, web, and campus resources you may need to use in your online course. Check to ensure your computer is working properly, you have access to all needed software, and you have performed all needed updates. Visit the University Library for resources to assist you throughout the semester. It is important to stay organized. Organize your files in a way that makes sense to you, and keep a copy of anything you submit until final grades are posted. If a technology problem requires you to resubmit an assignment, you will have access to the file. Take good notes while doing your readings or watching lectures just as you would in a face-to-face class. Online courses give you flexibility in terms of when you do your studying, but that doesn't mean you don't have to study! You will need to schedule enough time in your personal calendar to study and complete assignments. Treat those blocks of time as you would a face-to-face class by sticking to them, letting your friends and family know you are unavailable, and consistently using your workspace. Keep a close eye on assignment due dates, adding those to your personal calendar as well. Just as with a face-to-face course, interactions with your peers and your instructor are critical to you having a rich, engaging experience in the course. Be sure to go out of your way to introduce yourself to others, as these are the people who you will work with throughout the semester. Your instructor is there to help you, even if you never meet him or her in person. Additionally, there are tutors available in a variety of subjects. Because the course is online, you can expect to do a good bit of reading as an online student. You can expect regular readings from your textbook and perhaps online supplemental materials. You will also spend time reading what other students write in the course. Instead of having oral course discussions, you will have written ones through the course discussion board. The discussion board is the "conversation" of the course and is vitally important. There are several ways to get help with your online course. At the first sign of trouble or anxiety, contact your instructors using the discussion board, the email tool in the course, or their external contact information provided in their syllabus. If you have any other questions about your online course, or just need some advice, you can contact your Director of Online Learning. We are here to help! D2L is an integrated learning platform designed to create a single place online for instructors and students to interact, either for a completely online course or as a supplement to a face-to-face course. BrightSpace provides students a location for accessing their online courses, including the syllabus, course calendars, lessons, materials, quizzes, exams, discussion boards, as well as a dropbox for submitting assignments. FVSU Online courses are housed in BrightSpace. First-time Users: Select Forgot Password to be supplied a password reset link for access. NOTE: Password reset link is sent to the Banner Web preferred email address (generally the FVSU’s email account). If you are taking an eCore or eMajor class, check your campus email for the correct log-in information. Where can I get help with BrightSpace? 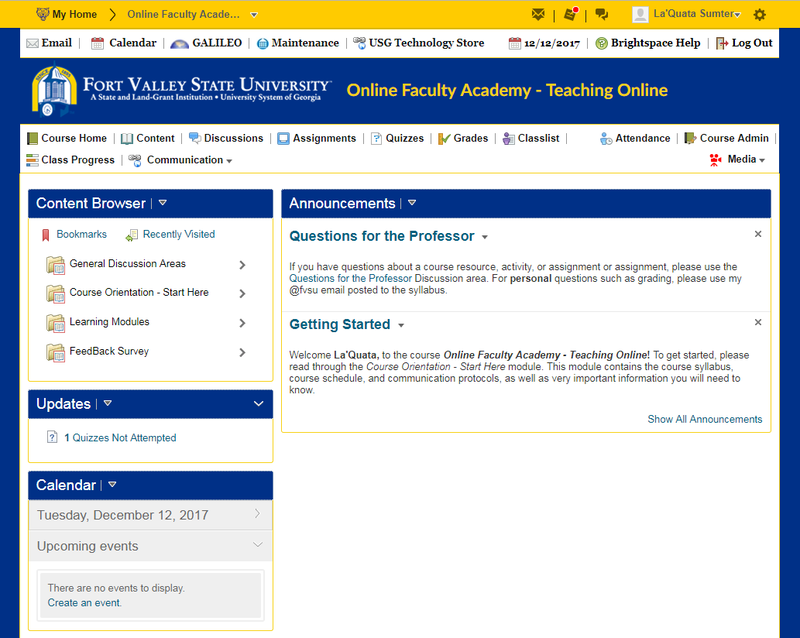 FVSU online courses are housed in BrightSpace, and a sample course homepage can be found below. I have completed the Online Learning Introduction Quiz and understand my responsibilities as an Online student. By typing in my name below, I acknowledge my intention to adhere to all Online Learning requirements and policies.